Palm Event Center in a few words: a unique vineyard, many different spots for photos, great service, professional. One of the best vineyard you must have as your wedding venue! Although we haven’t experienced this wedding venue as a guest, we’ve been here to capture more weddings than we can even count. 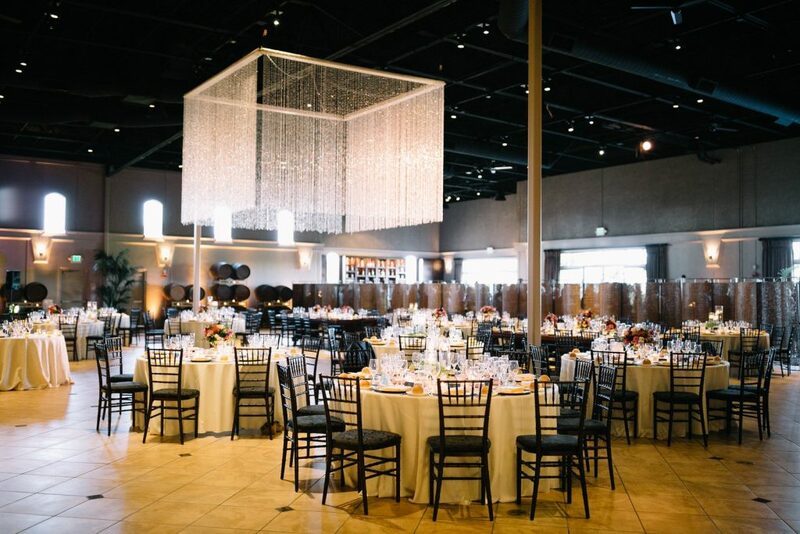 This post is our review of Palm Event Center based on our position as a wedding photographer. As a photographer, we evaluate the service quality of a venue by looking at how they treat the vendors, not the guests or the couple. The reason is simple. Among everyone (vendors, bride & grooms, guests), vendors are usually venues’ lowest priority. If they treat the vendors well, we are certain that they will treat you and your guests far better. Indeed, we see the way the staffs interact with the guests: so professional and prompt. 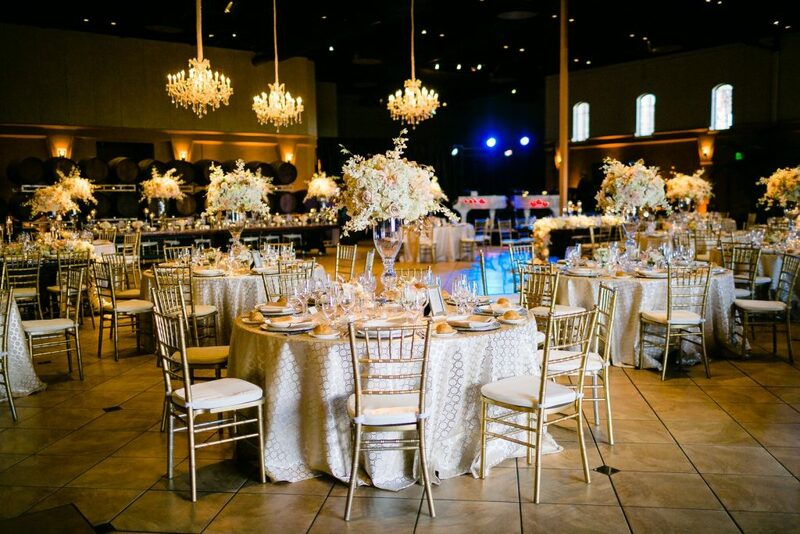 At every wedding that we’ve documented at Palm Event Center, they really care about us and other vendors. We are always welcome with a cart full of snack, water, and wedding timelines. They coordinate all activities and make sure we are fed on time so that we don’t miss any important moment. Moreover, they always check in with us and make sure that we get all the shots we need, particularly the detail shots. One favorite shot many couples want to have is the entire reception hall, neat and clean with no one in the background. They clear the room, inform us when everything is all set and how many minutes we have before they let the guests come in. This makes the shot like a piece of cake. Such things sound so simple, yet many other wedding venues don’t even try. 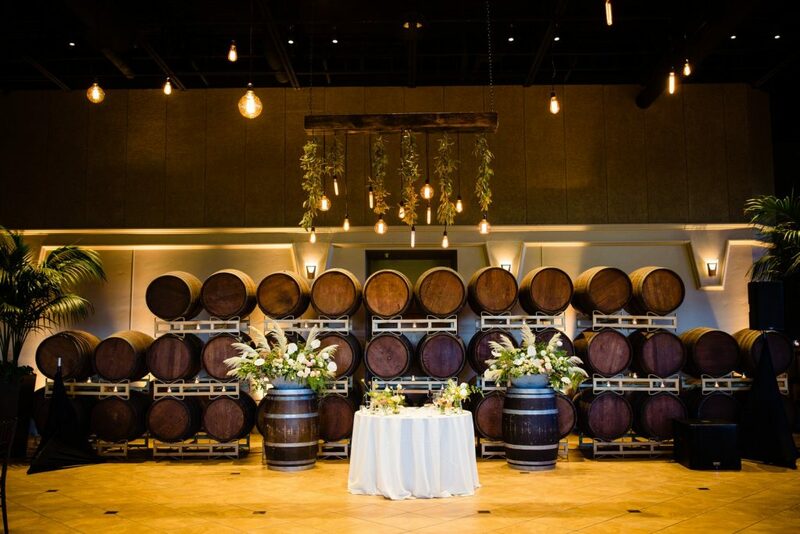 Unlike other vineyards, Palm Event Center offers a greater variety in term of views for photos. The first one, and also the signature view of this wedding venue, is the two long rows of palms along the main driveway. At the end of its driveway, there is a big building. Although it is not the one where your wedding will be at, it is a great spot for photos as well. Then, of course, comes the vineyard. The look significantly changes according to seasons. During the summer, the vineyard is green and so beautiful. If you get lucky, you might find some grapes too. During the fall, it turns yellow, and then, there is not much left near the end of the season. In our experience, we find more couples prefer taking photos in the vineyard when it is full of leaves and lively. 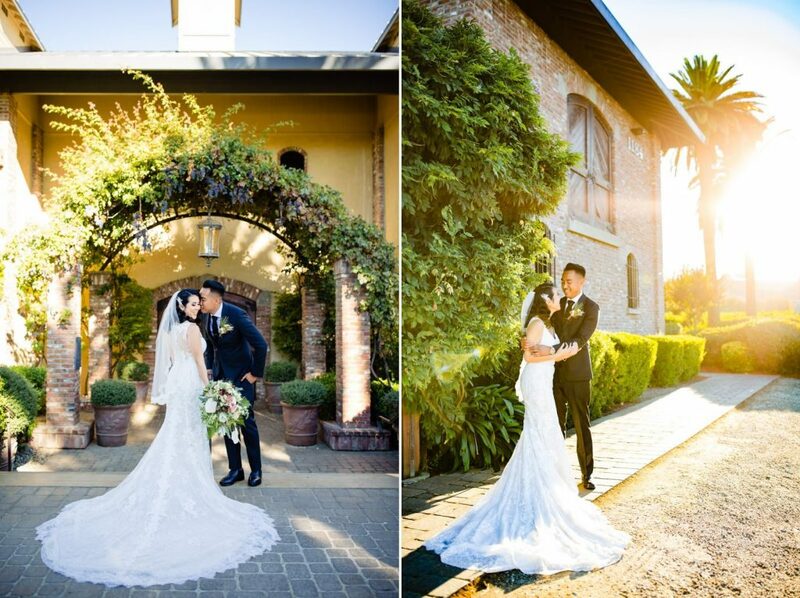 Photos taken in the vineyard can look similar regardless of the wedding venue. 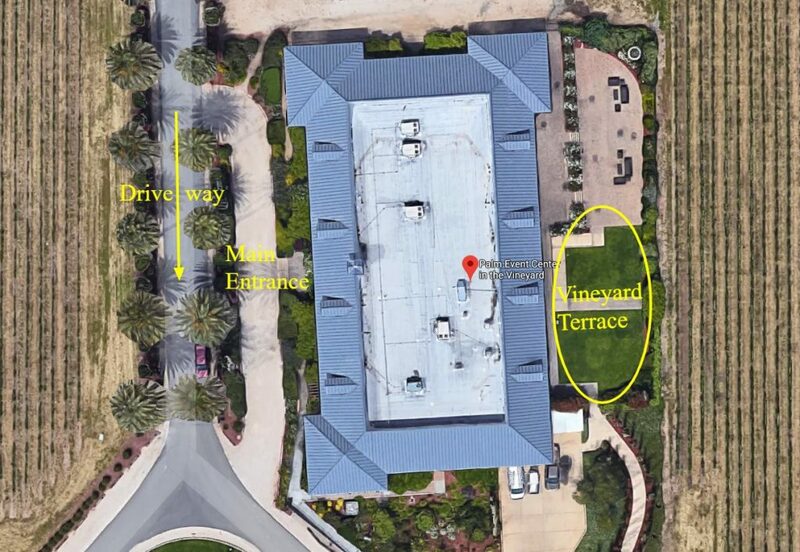 With Palm Event Center, besides the vineyard, the main building offers several good spots for photos, at the main entrance and on the left side. With so many different spots to take photos, we recommend you to set a time for portraits before the ceremony, and again during the sunset. If you choose this option, a first look is necessary. If you wish to save all the portraits for sunset, it might be too short to take advantage of these amazing views. For more photos, you can check out our most recent couple at this wedding venue. 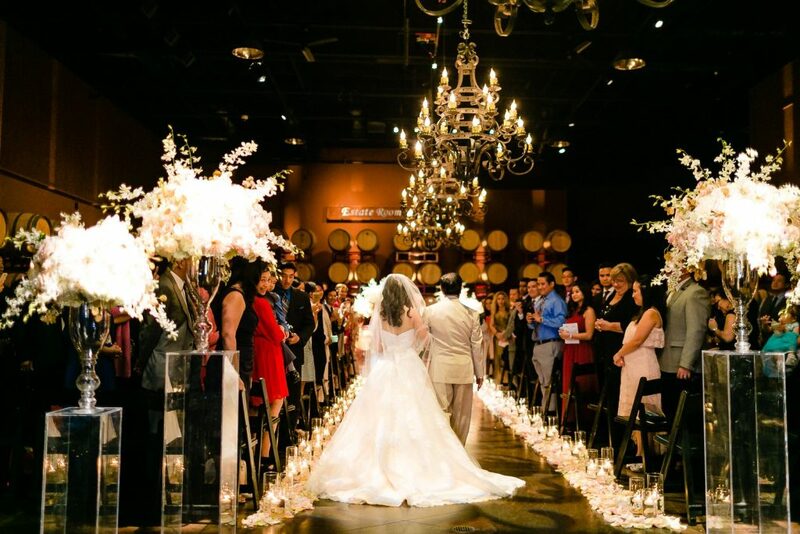 One of the best things about Palm Event Center is that you have both indoor (called ESTATE ROOM) and outdoor (called VINEYARD TERRACE) to hold your ceremony. None is more beautiful than the other. They are just uniquely beautiful. If you plan your ceremony outdoor and you’re afraid it might rain (which I think unlikely in California), you still have a nice indoor backup which will not disappoint you. 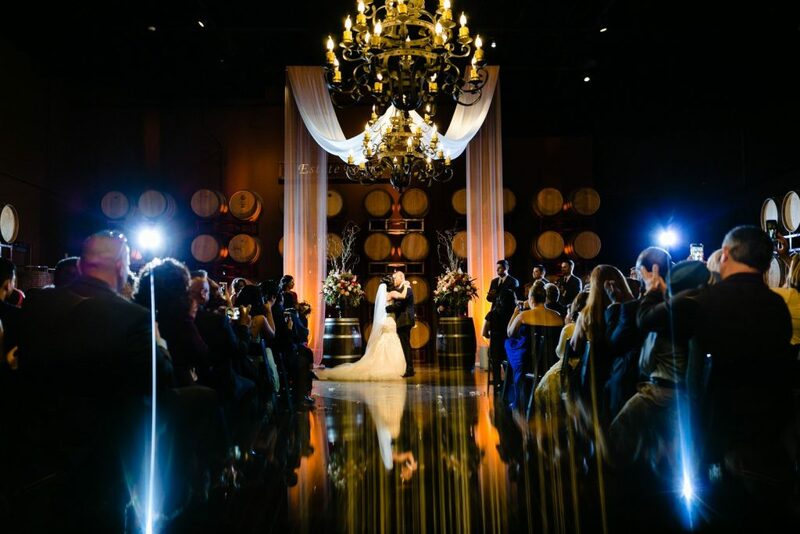 If you have your wedding in the winter, the Estate Room will give your guests a comfortable time. 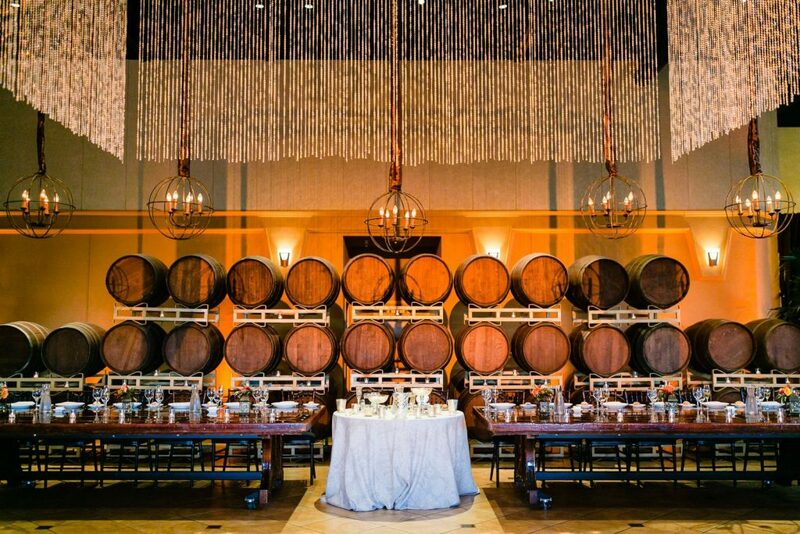 The Estate Room is characterized by rows of barrels, centered with gorgeous chandeliers. With some personal touches for the center aisle, you can make this room as amazing as you can imagine. The overall ambiance is very cozy, romantic, and elegant. As you can see in the photo above, the Vineyard Terrace is on the right side of the building and the sun goes down on the opposite side. Thus, the building will naturally block the sun and cast a strong shade on the ceremony site. Does this matter? Yes, it does, A LOT! Technically speaking, if you are in the shade completely, the photos will look really nice. If there is no shade, the photos still look decent if you are completely in the sun. However, if you are in half shade and half sun, the photos might not look as good as the other scenarios. The 1st photo was taken at the very beginning of the ceremony. The 2nd photo was taken half-way through the ceremony. With creative style, this creates a dramatic effect. However, in general, both photographer and videographer agree this is not an ideal lighting situation. Fortunately, however, this situation won’t last all the way through your ceremony because the sun goes down quite fast. Toward the end of the ceremony, the shade will go all the way up, leaving a very nice soft light. To have the best ceremony photos, the important thing is to schedule the ceremony at the right time. This leaves you completely in the shade (preferred) or in the sun. 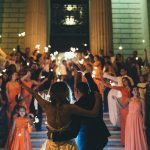 If you plan your wedding far in advance, visit the venue a year in advance can help you figure this out. 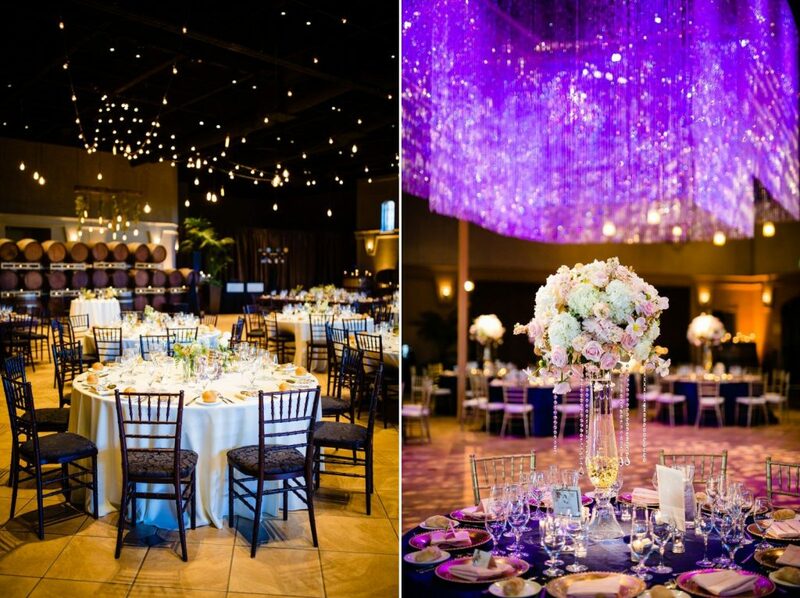 The room has a big advantage over many other wedding venues: high ceiling. With this, there are many different types of decoration you can choose: various styles of giant chandeliers, market light, all kinds of florist decor, etc. One minor drawback is that Palm Event Center is not a very large wedding venue. It can hold up to 350~375 max. We think this is a pretty good capacity that can hold most weddings. However, if your guest count goes beyond that, you might have to look for another wedding venue. The best alternative is Casa Real at Ruby Hill Winery, which can accommodate up to 400~500 people. Our review of this wedding venue is coming soon. 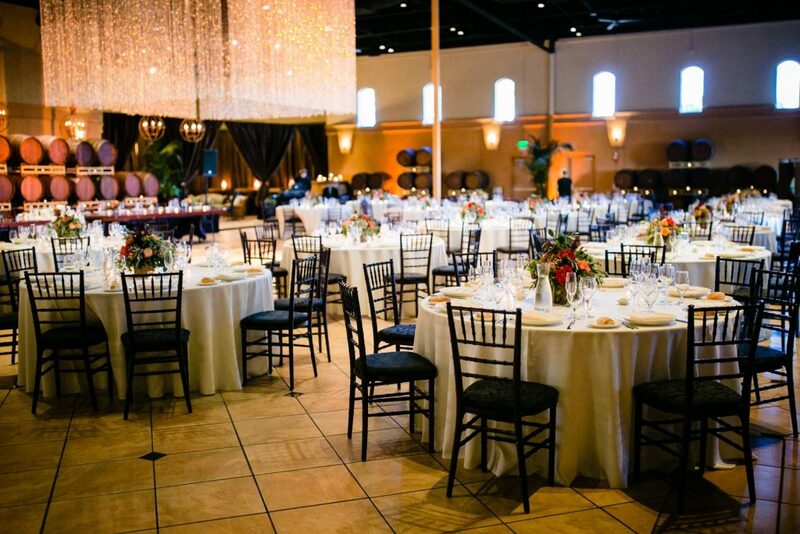 Overall, Palm Event Center is a great wedding venue in the East Bay that we highly recommend. It’s always in high demand. You should book it early to get the date you want, or you can also consider your wedding on a weekday as well.